The Kamel Lazaar Foundation and its initiative, Ibraaz, launched Dissonant Archives: Contemporary Visual Culture and Contested Narratives in the Middle East in Istanbul and London in September. Dissonant Archives is the second volume in series, Contemporary Visual Culture in the Middle East, co-published with I.B Tauris. Dissonant Archives is the first book to consider the ways in which contemporary artists from North Africa and the Middle East - including Emily Jacir, Walid Raad, Zineb Sedira, and Akram Zaatari - utilise and disrupt the function of the archive and, in so doing, highlight a systemic and perhaps irrevocable crisis in institutional archiving across the region. The result provides essential insights into the nexus between art and politics in the contemporary Middle East. The book was first launched in Tunisia during JAOU Tunis 2015 then with two formal events and a series of panel discussions in London and Istanbul chaired by the book's editor Anthony Downey. 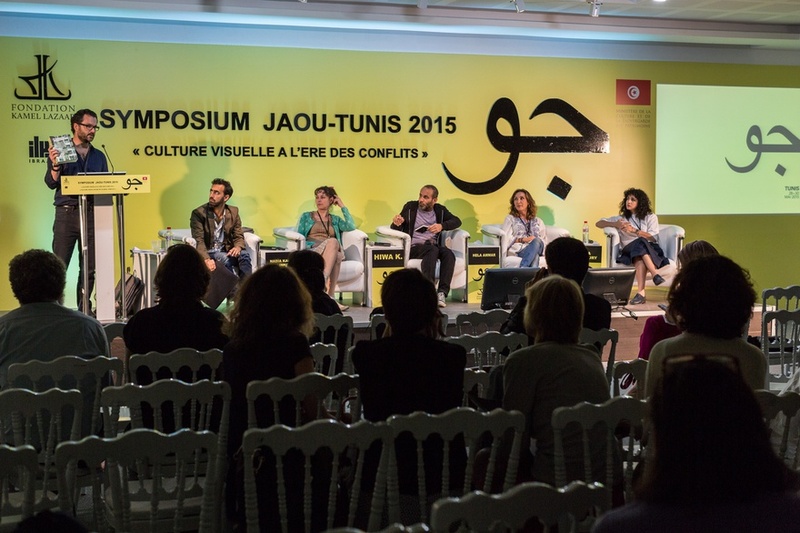 Book launch at JAOU Tunis 2015. Panel discussion and book launch at SALT Galata Istanbul. Panel included: Vahap Avşar, Burak Arikan, Meriç Algün Ringborg and Başak Şenova. Dissonant Archives Launch, London, 10 September 2015. Photo: Hydar Dewachi. Dissonant Archives Launch, Istanbul, 5 September 2015. Panel discussion and book lunch at Rivington Place, London. Panel included: John Akomfrah, Nick Denes, Guy Mannes-Abbott and Zineb Sedira. Lancement de Dissonant Archives, Londres, 10 Septembre 2015.